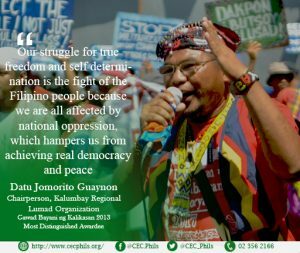 Since it started, Kalumbay’s campaigns are centered in protecting ancestral domains against extractive industries, seeing that it is the poor and marginalized communities of the indigenous peoples who are always at the losing end of such activities. The organization are also calling for the disbandment of paramilitary groups and for justice for the slain Lumad leaders. In recognition of the organization’s work, they were given the Most Distinguished Award in the 3rd Gawad Bayani ng Kalikasan on 2013. On July 8, 2018, most of Gen San 13 were released on bail after posting bail last July 6, 2018. This was granted by the Municipal Trial Court in General Santos City. ​ Emillo Gabales and Delia Catubay ​remained ​on detention​, as authorities insisted on their alleged involvement ​in murder and frustrated murder ​cases ​and ​we​re ​thus ​considered high-risk individuals. This is not the first that environmental defenders faced harassments from the Duterte regime. According to Datu Jomorito’s statement before arrest that they have recorded crackdown on people’s organizations, including fake terrorist lists, threats to people’s democratic rights and curtailment of basic civil and political rights.